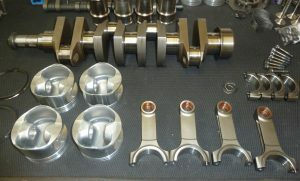 Using all the parts used for the 600bhp engine, this engine adds to the package with our own forged steel stroker crankshaft and con-rods produced for us to the highest standard by Farndon Racing in the U.K to give us a 2200cc engine. We use Mahle motorsport forged pistons custom made with ultra short compression height to enable a longer con-rod to be used with the Farndon crankshaft, resulting in a superior rod stroke ratio, over other stroker Evo engines! Fitted with either a larger Garrett HTA35 or Precision PT6262 CEA, this is a super responsive low lag 700bhp engine. We produce this engine in various compression ratios to suit fuel type and usage, from low compression super unleaded pump fuel, to 9.5:1 compression for race fuel. In addition, we also offer this engine with a dry sump system for those who are doing tarmac circuit racing. We use the Pace/APT developed kit installed using our own hardware. As an alternative, we also offer the AMS sump fitted with an Accusump, again essential for tarmac circuit use, especially when used with increase downforce, such as the cars we have produced for Time Attack utilising very high downforce wings. Extensive data logging has shown the wetsump system is very prone to oil surge on long high G corners! 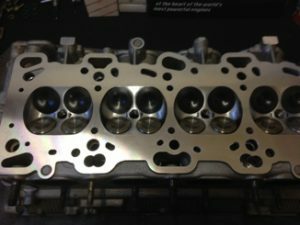 Unfortunately due to the Evo’s very dainty crankpin dimensions, it won’t tolerate oil pressure under 45psi at full load and high rpm, and big end failure with a thrown con-rod is the likely result should surge occur on track! As the previous engine, but with enlarged turbo (usually Garrett or Precision), larger inlet manifold plenum with large DBW electronic throttle, wilder cams and 4” exhaust system. High power individual ignition coils are now used with the AEM Infinity engine management, along with a change to a 12 tooth crank timing wheel, and twin Bosch motorsport knock sensors. 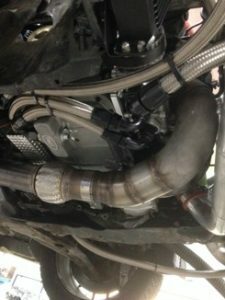 This setup provides vastly improved spark quality and the ability to run individual cylinder knock control to allow the engine to be pushed to it’s limit. The 4G63’s relatively small bore and long stroke setup is ultimately it’s downfall in achieving very high reliable rpm and as such we usually advise no more than 8500rpm. This does limit turbo potential and hence ultimate power! However for brief periods the engine will reliably run at 9000rpm and if used with a suitably large turbo such as a Garrett GTX42, can produce over 1000bhp!